It is that time in December where my house is decorated from head to toe with Christmas decor and I love it!! Most of us cherish this time of year as it brings to mind wonderful memories of growing up with the excitement and anticipation of the season from the perspective of a child. I have to admit that I haven’t really grown up when it comes to Christmas. I love everything about it and make a point to sit quietly every day and look around at my home and simply enjoy the sights, sounds and smells of this special holiday. One of my favorite activities is to find different ways to decorate each year. I am always very inspired and motivated by the creativity of others. I want to share some of my favorites. This arrangement of “pomanders” is one of my favorite classics. They are simply oranges and cloves. 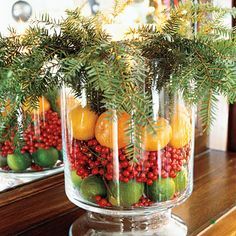 My mom loved to decorate with the fragrant fruit. She thought my brother, Steve, and I would love to sit and make them as a fun Christmas activity. While I loved the smell of the orange combined with cloves, all I really remember is how much it hurt my thumbs to poke the cloves into the oranges (cloves are a bit sharp!). But, as an adult, I have to have pomanders as part of my Christmas decor. And – yes – I’ve asked my daughters to help, much to their “delight”. But now we’ve learned to first poke the orange with a skewer and then insert the cloves. Much easier! Christmas isn’t Christmas without candy canes and I think this candy cane candle is adorable. 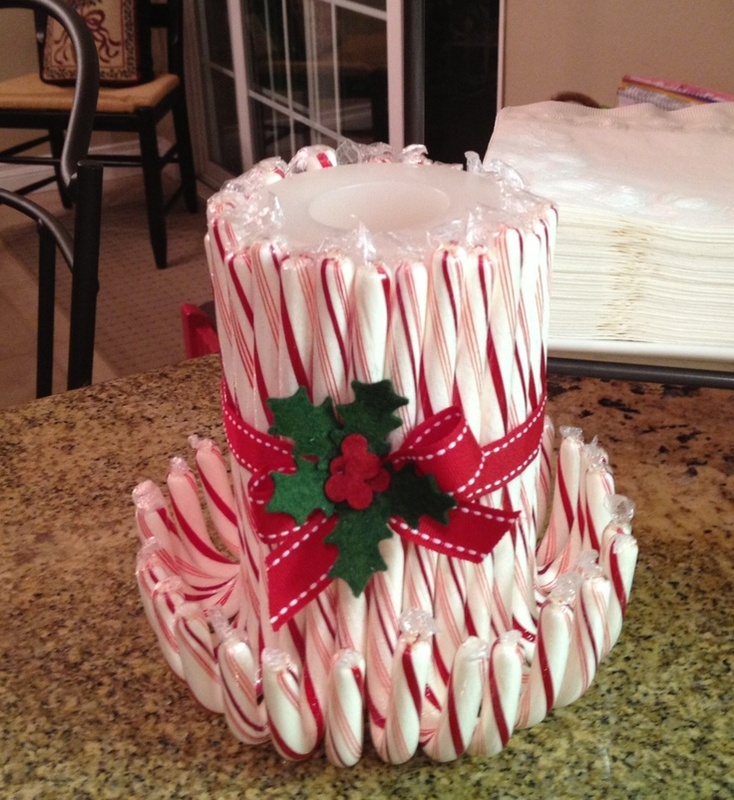 And so simple – just glue the candy canes around a candle and wrap with a ribbon. 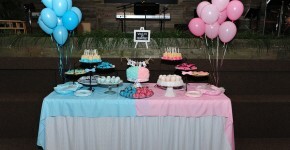 These creative little centerpieces are made out of empty kleenex boxes. So clever! Pick a candy, flower, Christmas pom or anything you can think of and hot glue them onto the box. 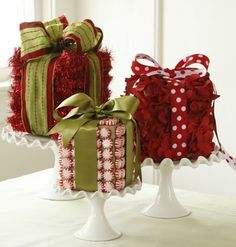 Wrap with a ribbon and you’ve got an adorable centerpiece. 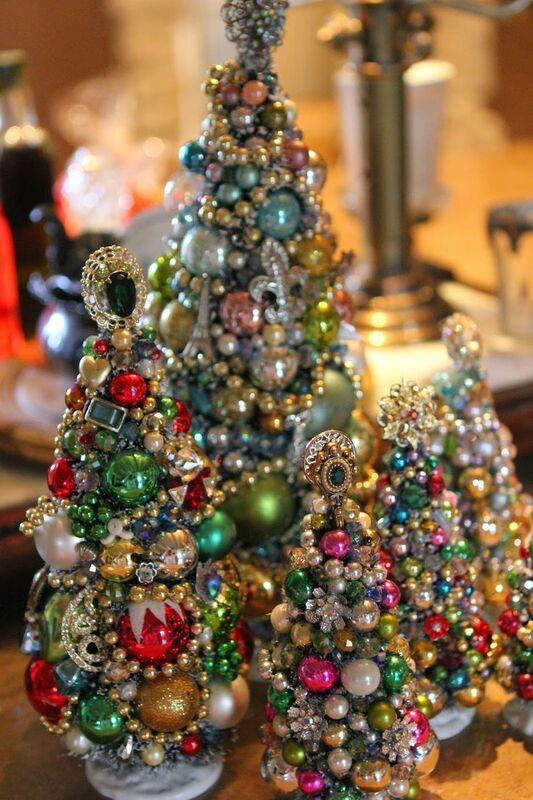 The beauty of these Christmas trees is stunning. They are made out of vintage jewelry! You can buy them or make them, and I think I’m going to try to make my own. I have so much beautiful jewelry from my mom and grandmother and haven’t really known what to do with all of it. But this is just perfect! I’m thinking purchase a foam tree form, get out my hot glue gun and see what happens! Looking for a teacher gift? 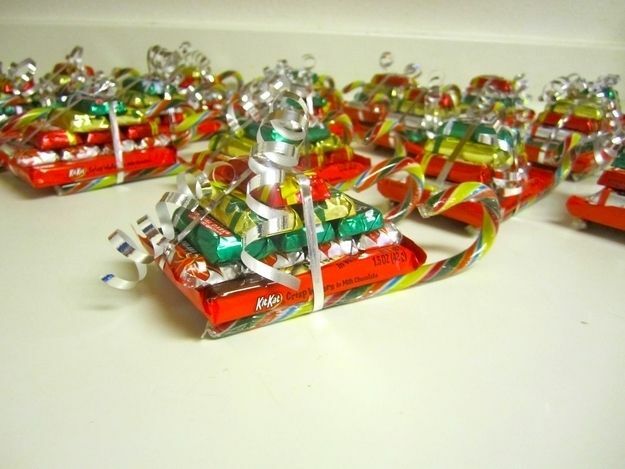 These candy sleighs are perfect. Inexpensive, creative and the kids can help make them. Who wouldn’t love these? This is my kind of Christmas decoration. 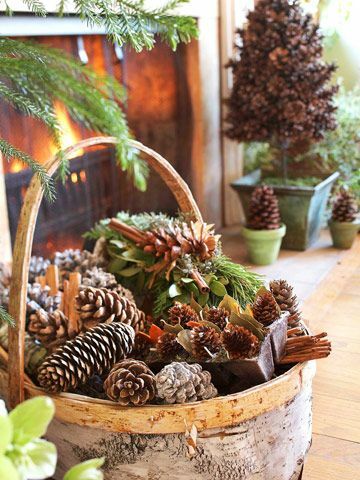 A basket filled with greenery, pine cones, cinnamon sticks and other natural elements. Set it by the fireplace and you’re in the Christmas spirit! Chalkboards are all the rage these days. Find an old framed picture you don’t like anymore and paint it with chalkboard paint. 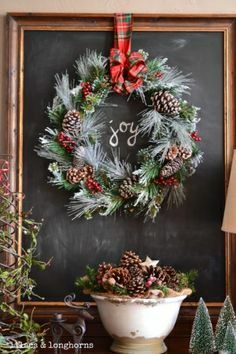 It can be used year round but is beautiful with this Christmas wreath. It really is simple to do but is so impressive! This arrangement is beautiful and yet so simple. Fruit, berries and greenery. Everything Christmas!